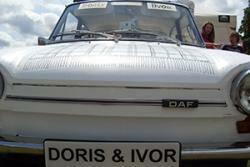 People attending the Green Man Festival should keep an eye out for two ‘virtual’ festival-goers- Doris and Ivor. The mystery cartoon duo, complete with cartoon campsite, car and sausages are the creation of research artist Carol Hanson, who, along with members of the Dementia and Imagination team are heading to the Green Man Festival this week. Carol, a designer and animator based in Cheshire has been observing some of Dementia and Imagination art sessions with participants living with dementia. The cartoon car and campsite are the first in a series of installations that Carol will make. Dementia and Imagination is a UK-wide research study looking to understand how art may help people living with dementia, their relatives, carers and communities. It is led from Bangor University by experts interested in evidence-based research to improve the lives of people with dementia, their families and carers. The Dementia and Imagination research is looking at the social, practical and economic benefits of art. As part of this, participants have been taking part in 12 weeks of art sessions with a professional artist, led by Denbighshire County Council’s Art Service. Carol was particularly struck by the humour in the sessions and her cartoon car looks to celebrate humour, living in the moment and dispelling the myths of ‘going a bit funny’. Her character Doris has been busy tweeting the couple’s summer adventures which have already seen them appear at the Llangollen International Eisteddfod. The festival takes place between the 20th and 23rd August in the Brecon Beacons. The car and campsite can be found at stall 12 in Einstein’s Garden, which is an innovative blend of science, art and nature, all explored imaginatively at the festival. Bangor University’s Teri Howson and Dr Katherine Taylor of Manchester Metropolitan University, who are both involved with the Dementia & Imagination project, are also participating in the Human Library at the festival. Members of the public can check out a human book to find out more about innovation, science and research.